Thiruvekka Sri Yathothkari Perumal temple is one of the 108 Divya Desams of Lord Vishnu situated in Kanchipuram. 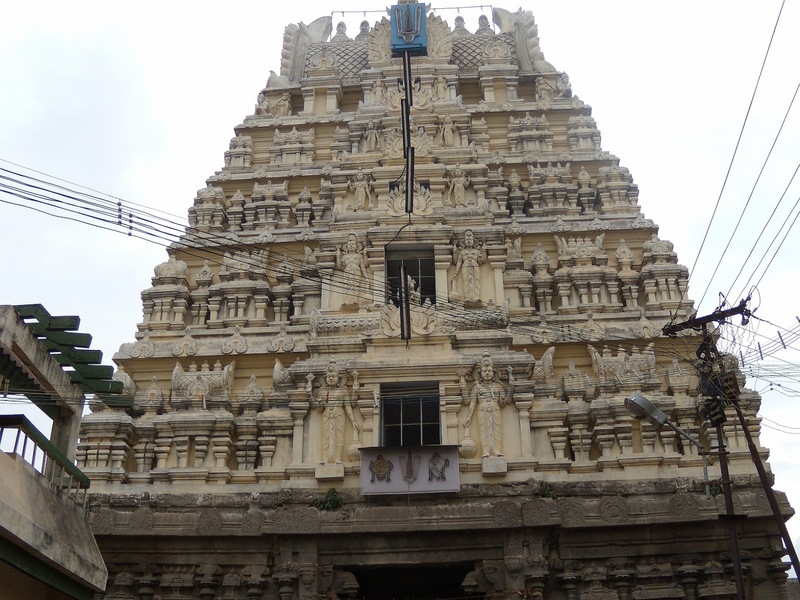 This temple of Lord Vishnu located near Rangaswamy Tank, Chinna Kanchi and it is just 1 km away from Sri Varadaraja Perumal Temple. There are many remarkable myths associated with this temple. As one enters the Sannidhi, one feels that there is something wrong, something different, that one is not normally used to seeing in Vishnu temples. It takes a little time for one to realize that Lord Vishnu, here at ThiruVekka, is seen in a different sleeping posture from right to left (Maaru Sayanam) with his head resting on the left hand. In all other Divya Desams, where the Lord is represented in a sleeping posture, he can be seen sleeping from left to right with his head resting on his right hand. The legend has that Thirumazhisai Alwar, one of the fervent devotees and a famous Vaishnavaite saint lived in Kanchi and served Lord Yathothkari Perumal in this temple. There was a Dasi woman used to clean the temple premises in this way she selflessly served the Lord. Seeing her sincereity and self-less devotion to Lord, Thirumazhisai Alwar blessed her to become a beautiful maiden. Later, the King of this city fallen at the enchanting beautify of this lady and married her. The King learned the truth of her captivating attractiveness and decided to meet Thirumazhisai Alwar. Kanikannan was a close associate and an an ardent follower of Thirumazhisai Alwar. One day, the King ordered Kanikannan to appear before the court. Kanikannan was produced before the assembly, King demanded Kanikannan to bring Thirumazhisai Alwar to the palace so that he could listen to Alwar singing and praising the glories of him. Kanikannan authentically revealed the fact that Thirumazhisai Alwar sung priaising the glories of no one other than Lord Vishnu and it would be an impossible task for him to sing praising the King. Kanikannan who was being a close associate of Thirumazhisai Alwar, the King had no doubt on the intelligence of Kanikannan. He persuaded Kanikannan with all the precious jewels, diamonds, etc... to praise his virtues. Kanikannan flatly refused to do so. The King was totally annoyed at the arrogant act of Kanikannan and ordered him to stay out of the Kanchi with an immediate effect. Kanikannan explained Thirumazhisai Alwar about the whole incident happened at the assembly of the King and his final verdict to leave the city. He prepared to leave Kanchi to follow the verdict, soon Thirumazhisai Alwar also joined with him. Before leaving this temple, Thirumazhisai Alwar fervently sung beautiful verses requesting Lord to be with them on their way out of Kanchi. Lord Yathothkari Perumal also decided to leave Kanchi at the true passion of Thirumazhisai Alwar. Consequently, Lord Yathothkari Perumal followed Thirumazhisai Alwar and Kanikannan on their way out of Kanchi. Shortly, the King realized the absence of Lord in this temple and deeply regretted at his ignorance. He requested Kanikannan to pardon him and received Kanikannan and his Acharya with due respect and honor to Kanchi. 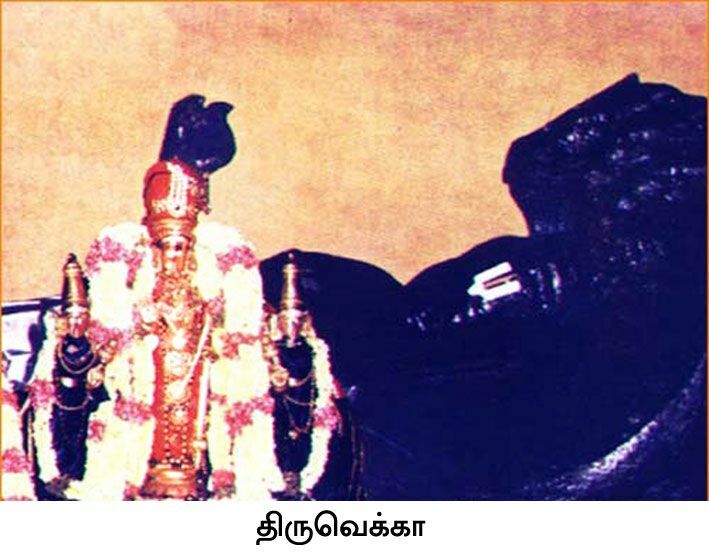 Thus Sri Yathothkari Perumal was re-positioned in the sanctum sanctorum with his divine presence. And after this, Kani Kannan along with Thirumizhisai Alwar came back to Kanchipuram. When returning, Alwar sung a song asking that Kani Kannan has returned back to Kanchi and he want the Perumal to go and sleep in his Aadhiseshan in the temple. On hearing this, Sriman Narayanan comes back to Thiruvekka temple and gives his sayana kols seva. Since the Perumal obeyed the words of Thirumizhisai Alwar and did what he said, he is called as "Sonna Vannam seitha perumal". Sonna vannam seitha means obeying and doing the same what was told to him. This is one of the purana story said about this sthalam. Five temples in Chinna Kanchipuram have stories relating to Brahmma’s Ashwamedha yaagam and Saraswathi’s anger at being ignored for the Yagam. Naan mughan, Brahma wanted to do the great Ashwametha Yagam in Kanchipuram and wanted Saraswathi to be along with him. So, he sent his son Vashistan to make Saraswathi come back to him. But, Saraswathi refused to come along with him. After this, Brahma devan started the Yagam keeping Savithri and all of his wives with him. On seeing this, the Asuraas (the Demon) wanted to destroy the Yagam and went to Saraswathi and made her angry by telling her what is happening. 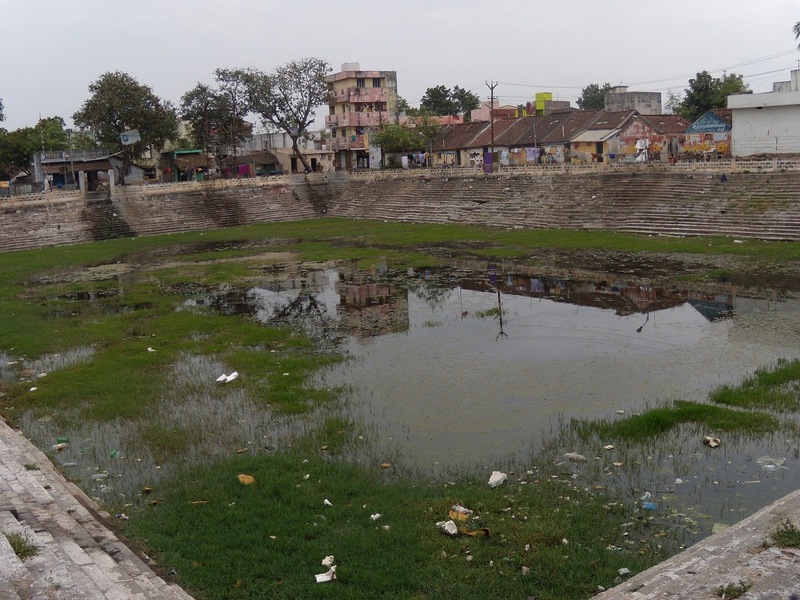 She got angry on Brahma devan and started as "Vegavathi" river along the south direction and flow across the place of the Yagam to destroy it . But, Sriman Narayanan wanted to stop Vegavadhi river and protect the Yagam from her. So, he stoped the river by lying across the river on Aadhiseshan. Because of this, this perumal is also named as "Vaga Sethu". This Vega Sethu then became Vegavanai and then finally named as "Vekkanai" and finally became "Vekka". In this sthalam only, Manavala Maamunigal expalined his "Sri Bashyam" to the world. Other Reasons for Maaru Sayanam: Two other reasons are also stated for Lord’s opposite sleeping posture. Since he left his residing place and later returned, he is said to have slept in the opposite direction as proof that he had left the place once. Legend also has it that, as Lord Vishnu came in a tearing hurry, on Brahmma’s request, to block River VegaVathi ( Saraswathi), he is said to have slept in the opposite direction. 07:00 am to 10:00 am ; 05:00 pm to 08:30 pm. 3 kms from Bus Stand. On the way to Varadharaja Perumal Temple.